Boxing is one of the oldest of sports, dating back to Olympic times in 688 B.C and takes on many different names and nicknames. Pugilism, Sweet Science, Gentleman’s Sport are all different declarations of the sport and have been applied over the years, however, Boxing remains the staple name for the sport. Alongside the sport there is also the prospect of gambling on the sport, with boxing betting gathering a large audience of punters and fans. The thrill of winning big as a result is what most prominently drives them to gamble. Boxing gathers in an extremely large crowd of gamblers, punters and also enthusiast eager to get their hands on tickets for a multitude of matches that feature some extremely talent members as well as up and coming young prospective stars. The sport of boxing is most prominently known by the organisation system; weight classes. The use of weight classes is essential for ensuring balance between competitors as well as offering a number of different fight categories and hence forth more fights. There are 17 different weight classes which cater to specific weights and attract different types of boxing betting categories, but are named differently by some organisational bodies. From heaviest to lightest in the World Boxing Association, there is Heavyweight, Cruiserweight, Light heavyweight, Super middleweight, Middleweight, Super welterweight, Welterweight, Super lightweight,Lightweight, Super featherweight, Featherweight, Super bantamweight, Bantamweight, Super flyweight, Flyweight and Minimumweight. However, under the World Boxing Council, Mimimumweight would be classified as Strawweight, amongst other changes that span across other different codes. The history of boxing is surrounded by many great competitors that have risen to the challenge of success and manage to make the sport one of their own. Even more so these players have superseded their status outside the ring and have even become somewhat household names, irrespective of whether or not they are truly known for being a professional boxer. Mohammed Ali, ‘Iron’ Mike Tyson and Sugar Ray Robinson are but a few of the boxing celebrities that the world has been blessed with in the past century, which in return has made bets for boxing increasingly popular among boxing & fighting fans in general. Adding wagering into the mixture, the world of Boxing has become even more exciting to follow. Despite the observed unassailable status that these players have achieved, there are still new competitors that are turning heads even today and making history as great fighters. Manny Pacquiao is currently the hot current favourite, eclipsing almost every game he enters and putting on a marvellous spectacle of speed, agility, power and endurance, enough to savour the crowd roars for action. Boxing offers a premium venue in which to participate, enjoy and also gamble. The sport shows pure human determination in the ring and pits them both against their opponent and themselves. 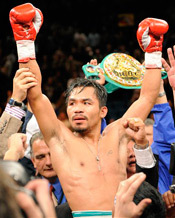 The excitement of the fight and backing of boxers makes boxing betting both an intense and exhilaration experience. At the drop of a hat, the tides can turn and the unpredictable can happen, but that is the joy of boxing. The fight goes on, the fighters continue and give it all their best; there is never a dull moment in the sport of boxing.